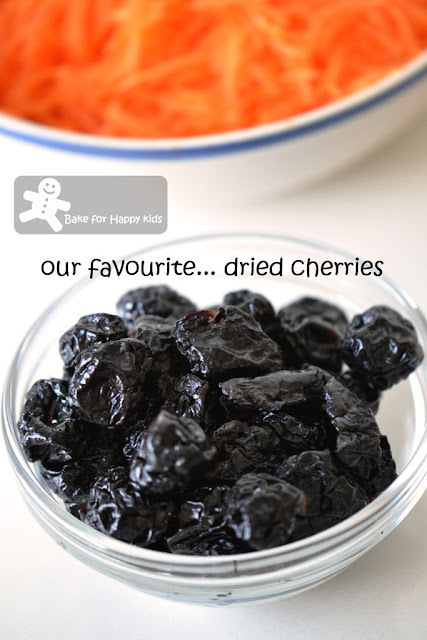 My son and I love eating cakes or cookies made with dried cherries. For this reason, I have been searching dried cherries for a long time and finally, I have found several shops in Melbourne that sells them. Yippee! Light and delicious carrot cake with dried cherries - This is so heavenly! Before proceeding on to the recipe of this cake, I would like to mention that Esther from Copycake Kitchen will be the next Little Thumbs up host for April 2013 and her theme is CORN! Please link your blog posts with Esther if you are cooking or baking with corn in April. Cheers! 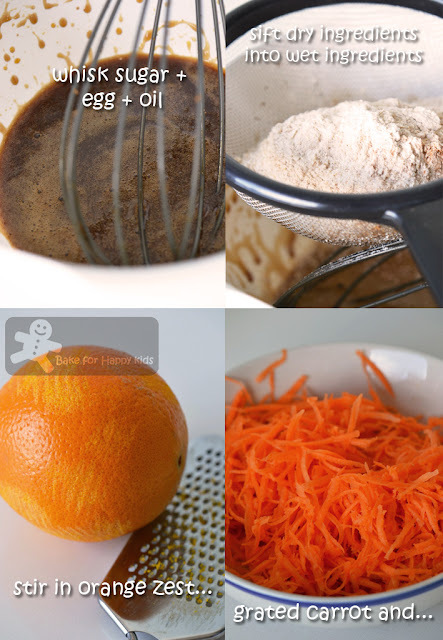 Begin by whisking the 175 g sugar, eggs and oil together in a bowl using an electric hand whisk for 2-3 mins. Then sift together the flour, bicarbonate of soda and the mixed spice into the bowl, tipping in all the bits of bran that are left in the sieve. Now stir all this together, then fold in the orange zest, carrots and sultanas (or dried cherries). After that pour the mixture into the prepared tin and bake on the centre shelf of the oven for 35-40 mins, until it is well risen and feels firm and springy to the touch when lightly pressed in the centre. While the cake is cooking, make the topping by mixing all the ingredients in a bowl until light and fluffy, then cover with clingfilm and chill for 1-2 hrs or until needed. 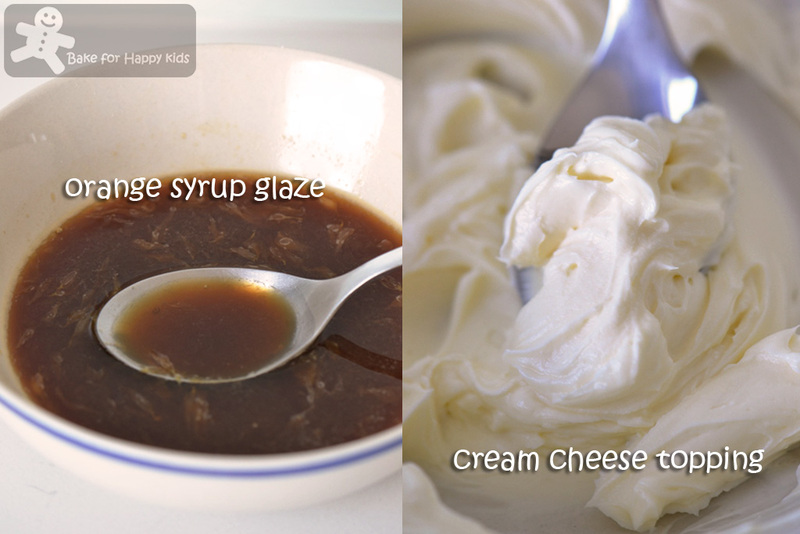 Now you need to make the syrup glaze, and to do this whisk together the fruit juices and sugar in a bowl. Then, when the cake comes out of the oven, stab it all over with a skewer and quickly spoon the syrup over as evenly as possible. Now leave the cake on one side to cool in the tin, during which time the syrup will be absorbed. Then, when the cake is completely cold, remove it from the tin, spread the topping over, cut it into 12 squares and dust with a little more cinnamon (I didn't do that). Note: Using half amount of the recipe, I have baked the cake with a 10 cm x 20 cm loaf pan at 150ºC fan forced for 30 mins. I piped the minimal amount of cream cheese topping on my cake and decorated with some fondant carrots. Oh Zoe, what a beautiful carrot cake...last night I was craving for carrot cake and now I see yours...so tempting...I love how you decorated it. Your cake looks great. I love carrot cake but so sad my children dont like it! Yum! This looks soo good. I wish I had your decoration skills! Like that you made this low-fat, it looks very yummy and super cute as well, great job! If this isn't a gorgeous cake, I don't know what is! This looks SO good, Zoe! That is a great carrot cake, I like the idea of soaking the cake with orange glaze. 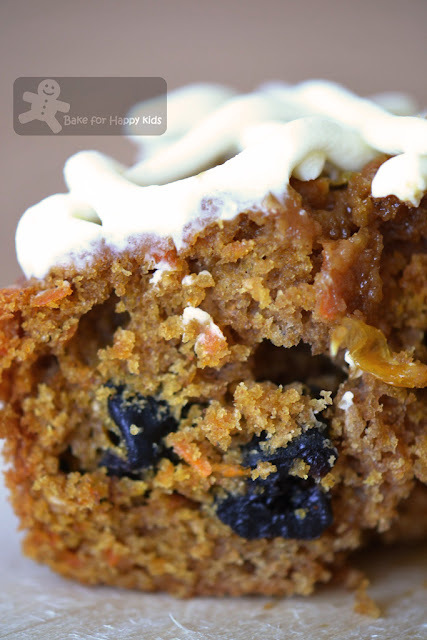 That looks so yummy...I have not baked carrot cakes for a long time already, I am pinning this! Your carrot cake is well decorated. Carrot and orange sounds great combination. Like your fondant carrots. Carrot cake is nice and healthy, always. Lovely cake. I love carrot cake and will try this recipe soon. Zoe, I made this too, just haven't posted.. I love the recipe. Your carrot cake looks great! I love that it's also low fat. 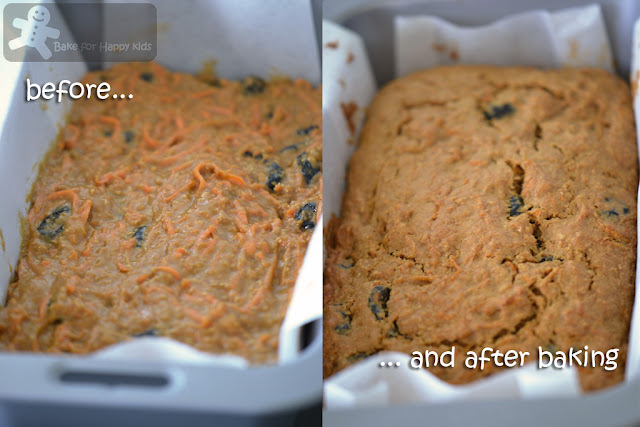 =) I recently started liking carrot cake and it'd be a great recipe to try. Thanks for sharing. Zoe, your frosting and those little mini carrots are the cutest and prettiest! Beh tahan! I would love to try this recipe, the orange glaze sounds good! It seems so tempting!!! !I will definitely try it! Love the orange syrup with the carrot cake. I want to try this soon! Looks yummy! Hi Zoe! Low fat! That's nice! Love the mini carrots toppings.. cute..
Hope you're having a lovely day dear. Low fat but moist... magical! I like the cute carrot toppings on your cake too. Your carrot cake looks so beautiful! This really looks like a great cake! This looks so so pretty and scrumptious. Love the cream cheese piped lines and the super cute fondant carrots. A swell job. Zoe, I'm finally having some time to sit and catch up and wanted to pop by to see your blog....and am SOOOO glad that I did. I love, love, love carrot cake. I am loving how you decorated it. I will have to give this a try. Those close ups make my mouth water, and the carrot decorations are a lovely touch. This looks great and I love the carrot decoration, too cute! Zoe Zoe, not only your son like this cake, this old lady here also like it, it is so kawaii! 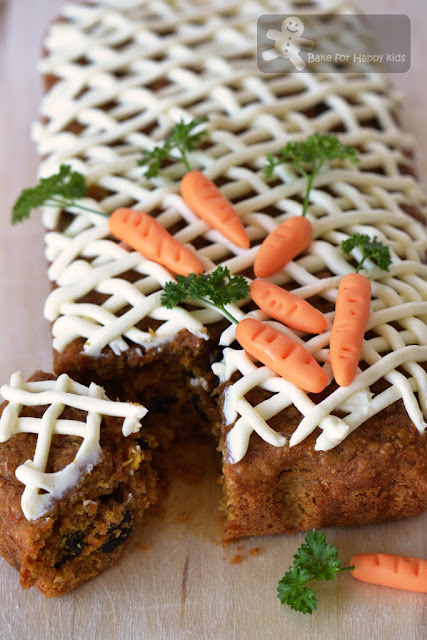 Your carrot cake looks so beautiful with the piping and miniature carrots on top! And the cake texture looks so moist and delicious! I have not tried any of Delia's cakes before, this looks like a winner! Thank you so much for taking the time to check out my blog, I appreciate it. I look forward to reading more blog posts, yum! Lovely cake, Zoe! It looks so moist and truly delish...and I just adore how you decorated it! LOVE delia smith's recipes - I've used this exact same one! It's really so so yummy, love the addition of cherries though! I love pineapple in carrot cake, cherries seem like a great alternative. This carrot cake looks great. I posted (Japanese style) carrot cake recipe too a few weeks ago. I'm going to file yours too in my file recipe. I love your photos! I’ve tagged you in my site !! Thanks for giving me this award. Cheers! Not only is your cake so pretty but the texture looks perfectly moist and airy. Nice one, Zoe. i shall try this, Zoe, looks real good! That's a gorgeous looking cake! So nicely decorated. I'd like some; then a second piece, please. ;-) Good stuff - thanks. Hiya zoe, that looks lovely moist+ that frosting looks lovely and creamy. My Cupcake Habit Vb POST. I made this for Easter and it was a huge hit with my family. 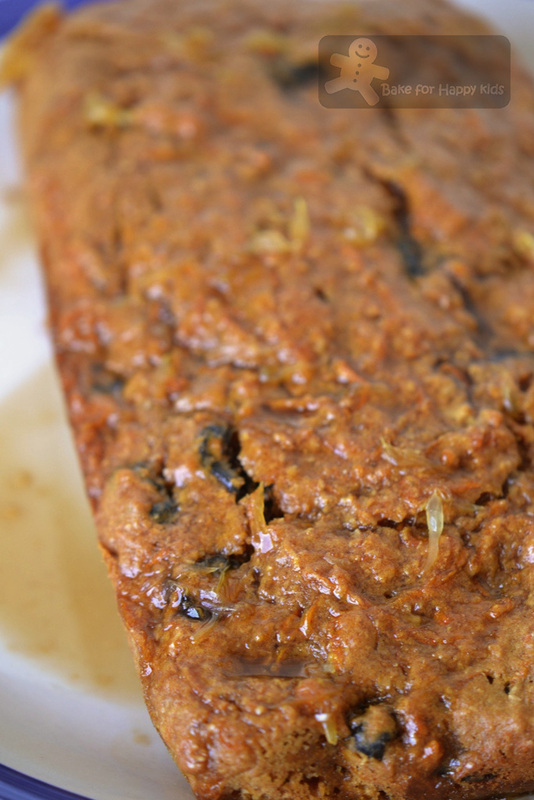 I love carrot cake and this was the best ever and SO very easy to make. This will be a family standard. It was moist and yummy and the frosting was perfect.